I don't know why we started calling them "dialog puzzles", they aren't really puzzles, they are more "dialog trees", but "dialog trees" just doesn't have the same flair that "dialog puzzles" does, or maybe it's just me, but I'm going to call them "dialog puzzles". Maniac Mansion didn't have dialog puzzles. I often getting quizzical looks when I say that, followed by "Yes it did!" and I follow with "No it didn't." and they retort with "Are you sure?" and I come back with "Yeah, I think I would have remembered that." Zak didn't have dialog puzzles either, nor did LOOM™. Dialog puzzles at Lucasfilm first appeared in Last Crusade and I like to think of them as version 1.0. Dialog puzzles are really nothing more than a list of choices in the form of dialog for the player to say, or more specifically, for the player to make the main character say. You begin a conversation by doing a TALK TO. The main character usually starts off with a line of dialog, then the other character says something, then the player presented with three to five choice of things they can say. You choose one of them and that takes the conversation in a new and you end up with some more dialog choices. The dialog trees are typically only a few levels deep and often return to a top node. Choices you've already made often disappear (but not always). Dialog puzzles in the Lucasfilm adventures were invented to break up long cut-scenes. If you have two minutes of information to get across and you break it up with the occasional choices from the player, it can turn a long slog through dialog into a joy. The dialogs in Indy were 1.0 because we were really just feeling our way around, trying to understand the rules. Noah Falstein wrote most of the dialog in that game and I thought he did a great job of starting to figure all this out. But it was Monkey Island where the dialog puzzle really started to shine. A lot of that credit goes to Dave and Tim for being such good and funny writers, but also because we were starting to figure out the rules of what made a good dialog based on the experience with Indy. I always felt that a dialog should make retrospective sense. Meaning, when you got done with the tree, you should be able to print out the dialog, read it and it should feel like a real conversation, which gets me to one of the most controversial issues with dialog puzzles: You are having a conversation. The choices in the dialog tree should be lines of conversion, you select them and the main character says them and this moves the conversation forward. It is through the act of having that conversation that you make the choices, the choices do not elicit conversation. "It would be swell if you could loan me some gas for my chainsaw, fine sir?" In the first example, you're having a conversation with the goal of getting the gas for your chainsaw. In the second, you're telling the game you want the gas and it builds a conversation around that. I inherently dislike the second. It's boring and it takes away the single greatest thing about dialog puzzles: being able to tell four jokes at once. Someone can say something to Guybrush and then the player sees four funny responses and they read down them and (hopefully) laugh at each one. They don't need to select it, they just need to read it. You can do a lot more character building that way and tell a lot more jokes. I could go on and on about dialog puzzles. I have a whole list of rules for structuring them that I'll try and dig up at some point and post, but I know what you're thinking: "What the hell does this have to do with Thimbleweed and how do I get it out of my backyard?" I still haven't decided if we're doing dialog puzzles in Thimbleweed Park. It's not that I don't want to - I really want to - but they are massively time consuming to write and implement. Having them increases the dialog in the game by a factor of ten. You're no longer writing one conversation, you're writing ten of them and that doesn't even include that we have five playable characters. If we do them, the dialog could end up being somewhat generic, with only special lines here and there for the different characters. It doesn't take much to make them feel special, but it's completely unrealistic to expect that all five characters will have completely different conversations without the dialog trees becoming very thin, which might be OK. It's an odd creative problem. What I do know is that I don't have the time to write the dialog AND do the system programming. One of those will have to give and that starts to run into budget issues. We don't have the budget to hire an additional writer or a system programmer. Making games is all about trade-offs. In SCUMM all the dialog puzzles were hand coded and it was a pain. For DeathSpank I came up with a script format called Sassy that helped a great deal, but was just a little too wordy and programmery. Last year, I went to a great talk at GDC by Jon Ingold about 80 Days and was impressed and inspired by the simplicity of their scripting format. Last week I played around with our dialog system and spent some time figuring out a format for the scripts and implemented it in the engine. sheriff: Howdee. The name's Sheriff Crook, local sheriff of Thimbleweed Park. I don't remember calling the feds-a-renos. That's what you are? Feds? Hard to miss the goverment issue suits. sheriff: Why would I do that? I get a 5% law enforcement discount. ...it's better off there than in a tub of formaldehyde. sheriff: Whoa... hold your horse-a-renos, no need to get snippy. sheriff: Nice to meet you, agent-a-renos. sheriff: Looks like you heard about our little murder-reno out by the bridge. reyes: There nothing 'little' about murder, sir. sheriff: No sense in wasting everyone's time-a-reno. This cut-scene is starting to get long and it's only going to get longer. Let's find the coroner and get you on your way. I like writing in pure text, I don't like fancy tools or clicking a bunch of UI to add nodes. I like to copy/paste and reflow large chunks of dialog with ease. So, there are two things I don't know. 1) I don't know if there are going to be dialog puzzles in Thimbleweed Park. 2) I have no idea how to get Thimbleweed out of your backyard. have you played Kentucky Route Zero. I did play that, it was very well written, but I often felt that making choices was just pressing an OK button. I never got the sense that I was navigating and exploring a conversion. I usually like to take a chainsaw and cut down the dialog trees because I don't like it when you make a selection and maybe miss out on some other possible responses. I don't think it's like that in Monkey Island, but it has been like that in RPG:s I've played. Ron, maybe Tim Schafer would write dialog trees for free in his spare time? For god's sake: Please, please DO dialogue trees / puzzles. For me exploring all options of these dialogue trees (and the funny reactions) were a good proportion of the fun I had with the old Lucasfilm adventures! What about extending the kickstarter campaign? If you get the needed budget you implement dialogs, elsewise you have a good reason for leaving it be. Wow! That's a really smart script format! Important question here: Which Thimbleweed species are we talking about, so we can know where the game actually takes place? I'm assuming the story happens in "north central U.S."? Montana maybe? Please, do the dialog puzzles. I really enjoyed them in Monkey Island and the rest of Lucas adventures. It makes me go very deep into the game ("suspension of disbelief"). You know what I'm talking about. You want to, and "Thimbleweed park" will never be finished without them (some emotional blackmail here). Dialogue Puzzles were also my favourite part of the old Lucasart games. It'd be a real shame if they were missing. For me, dialogue trees are only fun if they're real choices that can result in actual different outcomes within the game. I hate having to click through every dialog option just to find the one that will cause the NPC to e.g give me an object I need (and because of this mechanic, the same process for every NPC I interact with). I agree, clicking through every dialog option just to get some item (or whatever) is tedious. I also do not like it when I can start over the whole dialog again by just doing TALK TO <Ron Gilbert> again. Monkey Island, yes ... Anyone ??? I throw my lot in right here. Dialogue trees don't do much for me. I won't miss them. They can add flavour, sure. But I generally find them tedious. If this game was happening in "current time" I'd suggest implementing some kind of texting feature for these tree, eliminating the need for additional voice acting. But back in the 80's.... Did people carry pagers around then? Love it. There's your solution. People who love DTs can still have them. People who hate them will be able to endure them. There's a typo in the post. ..."but bare with me, this might be interesting..."
... "but bare, with me, this might be... interesting"
The dialog puzzles in Monkey Island were one of my favorite aspects of the game! I would love to have dialog puzzles in Thimbleweed Park, but I do understand the tradeoffs. I'm sure it will be a great game either way! I agree! More info on pledge updating is needed here! I think they also have another purpose: They help you identify with the character a bit more if you can choose the "tone" of your answer. In the sample script you can choose to be polite ("good cop") or be pretty a**holian about being a Fed ("bad cop"). I like it when a game gives me the illusion that I have some degree of influence. Like in Monkey Island where I would - of course - select: "I am Guybrush Threepwood - You are all going to die!" I would love it if Thimbleweed Park had at least some dialog options. If you do them then I would prefer them to be so that nothing get losts. It should be possible to explore every option and read every bit of dialogue and not require multiple playthroughs to read it all. In Indigo Prophecy/Fahrenheit it was the worst: They gave you a few seconds to choose and removed all other options and the info about the plot was lost. But that's just my personal preference. Ron, dialog 'puzzels' are important. It is what made Monkey Island so great. The humor was strongest in those trees. 3 or 4 jokes in one go. And its why Monkey Island has much stronger and memorable characters that Maniac Mansion for example. It is why i backed this game, and buy all your games. Not because of the great gameplay (sorry), but the jokes/humor and great characters you set up with them. I just want to point out that if "dialog puzzles" were not offered in the Kickstarter, it should not be assumed that they would make an appearance. It's just not cool to throw out a passive-aggressive claim stating that you backed the game because of something that was not offered. Passive aggressive? What? If you think my post is that, well that says more about you then about me.. I back anything Ron Gilbert makes. But i CAN tell the man that i really do hope he finds a way to include a few dialog puzzles in the game. Because, you know, i am a fan and i like those and would like to express that. Thats what this blog and comment section is for. But then there are always people who THINK they are moderators or think that they should talk for other people. Do them, but at places you already have puzzles at. This way if you get stuck making puzzles you can replace it with a dialog puzzle. The dialogs also dont have to be charactor specific if you treat it like a puzzle too. Ps: Dialog puzzles sound amazing in the thimblecon convention possibly relating to whos the best super hero or comics! YES DO THEM YES PLEASE DO THEM PLEASE YES. I really LOVE dialogue puzzles. I remember when I was a kid and played Monkey Island for the first time, it was the dialogues that made me fall in love with the game. To me, adventure games that lack dialogue trees feel a bit "cold". I don't know how to explain it but, as others pointed out, dialogue puzzles really immerse you in the game. They are the difference between playing the game and being in the game. I think dialogue puzzles are great for immersion and for providing subtle hints to solve certain puzzles. What I don't like about dialogue puzzles is when, instead of a hint, they ARE the solution to the puzzle. That feels cheap to me. Even though I loved Broken Age, I think that game had way too many puzzles which where solved just by talking. It seems like not doing dialogs is going to produce better quality writing, right? Since this is about Federal Agents, Dialog Puzzles are your chance to turn Insult Swordfighting into Insult Gunfighting. Put me in the camp for more dialogue. I think they immeasurably add to the character of the game. You HAVE TO include dialogue puzzles! Dialogue puzzles are one of the key elements of a "classic" adventure game! Also I LOVE, as you describe, to read through the various options! So much opportunity for great jokes! - It has sense if you are playing with one character (Guybrush, Indy), not with more than one. But of course, you can think of different sentences to be said by different characters. I remeber that if Zak gave the bottle of rum to the guard at Stonehenge, nothing happened. But if Annie gave it, something different (and very important!) happened. THAT'S what I would see in Thimbleweed Park. I agree with you. Although I like dialog trees it also works without them. For example there is this one game called Sack MacCraken (or so), which is still great. Thimbleweed Park may be more 1987 than 1990, but Ron Gilbert is going to be implementing his rules of adventure game design that he first used in the Secret of Monkey Island. in Thimbleweed Park. That being said, I'd advise against Dialog Trees because even though I love them (especially the insults and the puzzle to get the necklace from the head of the navigator), you don't have the budget for them. I agree. They're a fun gimmick that gives the illusion of choice, but they're not worth the trouble. The way I see it not every discussion needs to be a dialogue puzzle. I'd use them more as a salt in the conversations, not trying to cram them everywhere. That's some good thinking from you. NPC's getting brain-wiped constantly bothers me a little, as much as I love dialog trees.. Not that realistic -- the AI won't know how to convert that stuff into a holodeck program for us. You could get me to write it. I'm serious, and can provide evidence of my abilities. Please consider it! If you're actually looking for player input on this, here are a few points I want to make. Does the dialog flesh out the story? How much of the core story can you support with additional dialog? Do I want to make another game like this, after this one? Or even a third? Make this one more like Mansion, and the second more like Monkey Island? If you are not going to make another game like this after Thimbleweed Park? I'd say .. include some dialog. If you think you might be making more? Don't do the dialog thing. Unless it helps carry a lot of the weight of the story. PS: The thing is -- I love dialog trees and dialog puzzles. If you make them, they will NOT go to waste. But. Maniac Mansion has beauty in how the story is simple, and is carried mostly though interaction. I like both styles and this choice is a dilemma. Hence why I ask if there is going to be more. Because next time around, I'd do the other thing. I always liked the dialog puzzles. They made the whole atmosphere seem less sterile, less artificial. The one thing I did not like was that you could always just try out all possible combinations and that would pretty much solve the puzzle (and unlike puzzles where you had to combine inventory items, there was no running around through different rooms and it pretty much boiled down to going through three or four choices a number of times). I think the only situations where your choices in a dialog puzzle made any difference were in Indy IV, where you could choose one of three different "second acts", and the ingenious sword fighting puzzles in MI, where at first I did not even realize that I was solving a puzzle until after I had collected 4 or 5 witty comebacks. It would be great if you did dialog puzzles in TP, but make them so that choosing the wrong answers would permanently block some (easy) ways to solve a puzzle and only leave you with the hard, longer, more sophisticated and funnier way. So yeah. Nobody said it would be easy. Indeed, as has been pointed out, they aren't really 'puzzles' - more 'info, clues and cues' - but there is one more aspect to mention which I felt helped with the sense of immersion: when some of the dialogue options were dependent on different states, for instance having picked up a piece of inventory, having been told something important by another character och having visited/seen something. In those cases, being able to say "hmm, perhaps I should go talk to the sheriff about this?" somehow gives more depth to the experience. Please implement dialog puzzles, they truly were one of the things which contributed the most to both fun and atmosphere in Monkey Island and other adventure games. I understand it's hard because it's expensive and time consuming, but please only give up if there is no possible way out. I'm sure you will try your best, as you always do. You are standing in front of a house. A man is leaning to the wall smoking a cigarette. You take out chainsaw and start it. The leaning man runs towards you. MAN: "Whoa, whoa, whoa... what are you doing?" opt1-1 "I was going to commit a breaking and entering, do you mind?" opt1-2 "I just wanted to check if my chainsaw was still working. Seems to be." opt1-3 "Stand back or you might be the next in the chain of chainsaw massacre victims"
(which ever you choose -> ) MAN: "Look, I have a key alright"
YOU: "Great! Can you open the door for me?" MAN: "I could, but why should I?" opt2-1 "I'm a federal agent, and I'm conducting an investigation"
opt2-2 "I was here earlier, and forgot my... um... partner in there"
opt2-3 "I think there could be a note with a president's face on it for you inside..."
(if you chose opt2-1 -> ) MAN: "Oh, you are with the feds... Ok, no problem. Here you go." (if you chose opt2-2 -> ) MAN: "What? If there's someone inside, she can open the door herself." (if you chose opt3-1 -> ) MAN: "Sounds fishy, no dice. You can't bribe me." So, I would say, keep the opportunities for conversations to minimum, keep the conversations themselves lean, and I think there should be some sort of action after successful dialog. Dialogue puzzles are awesome - I agree with others that they draw you into the story more because you get to choose how your character behaves (in a limited way). It was especially awesome seeing how the writers got you out of the sticky mess you tried to talk your character into. Some of the hardest dialogue puzzles were the ones where you had to annoy NPCs so much that they would walk away because I didn't like annoying people (even digital people apparently). I hope that you find time in the budget for scripting a variety of conversations for each character - as you say, the opportunity for humour is greatly increased when you have a range of responses to read through, including self-deferential or fourth-wall-breaking lines. I seriously judge the dialogue puzzles to be unnecessary in Thimbleweed Park. I really like them, especially in Indy 3, but I always found that the lack of "talkative" interaction in Maniac Mansion to be part of the "magic" that rendered it the classic it is. You can interact with the NPCs by giving them stuff and performing action, and in reply you occasionally get some phrase. But you cannot stop and talk to them. You need to perform actions, not to find the correct route in a dialogue tree to trigger the result you need. Also, this contributes in making the NPCs more elliptic (and that was a plus in Maniac Mansion). Exactly. Maniac Mansion is beautiful in how it is seemingly a graphics adventure that is purely about interaction. That's a form of art that's just rare. I'd even go so far as to say, ditch the "Talk to" verb entirely, if you decide not to have dialog trees anyway - and trigger the dialogs when your characters do something specific. Trigger conversations as small scenes, maybe entirely non-interactive then. I'd prefer this much more than taking the dense dialog trees from Monkey Island and toning them down. It's either one or the other. Both have the magic, it's just a different kind of magic. Moreover, as someone said, some games did suffered from the abuse of dialogues. I'm glad to find out I'm not the only one that found displeasant going in a new location and thinking "gosh, another room full of people to talk to... I'm not gonna make it". Over time this become frustrating and repetitive. In the case of Indy3/Indy4 and MI/MI2 this was quite balanced... but, still, I favour the absence of dialogue trees. Where's the "Like" button? I demand a "Like" button! I used to like dialogs in adventure games, but now I just think straight dialogue "puzzles"/"trees" simply bog the genre. As someone else said in this thread, actively interacting with the characters to get a response, giving something to them to understand their personalities, is far better and funnier. I've recently experienced that with Broken Age: Tim has conceived a lot of specific answers when you try to use an object on the characters. They feel more alive in those moments than in their canonical dialog trees. I think this happens because the interaction is hidden and isn't that obvious: on the other hand, dialogue trees stop the game flow and give away too much. As for heroes' personalities, the "examine" verb is more than enough to avoid Zak's or Dave's silence in those old games. Of course, you may want to come up with some kind of interface to accomodate the agents' investigation: they are supposed to question the suspects, after all. I kind of like dialog trees, but only if my choices have defined consequences that alter some aspect of the game. Sometimes I think I would moreso prefer a cutscene instead of having to exhaust the gamut of dialog. I think dialog trees/puzzles should only exist if you cannot traverse the entire tree. Not only that, but what you decide to say should make a puzzle easier or harder (but never making anything impossible nor the result being the omission of vital clues or info; the clues or info would just be less/more cryptic). All that being said, I would hope Ron would be able to raise some more money to budget for some good dialog puzzles or find some chump/s with the ability who could volunteer their time. I think I would be more excited for the game if there wasn't any dialogue puzzles in it at all! Maniac mansion was magic in that it didn't have any, but every characters personality was fully realised. Where I do see the reasons for putting them in games that are more story driven, I have a much more enjoyable time figuring out what's going on through what's happening in the game rather than having to make a decision on what to say and then being spoon fed the games dialogue. This would also add to the replay value! Dialog puzzles, yes or no? There's no right answer. Both have great features. * No dialogs: I like The Cave and it doesn't have dialogs. Only a narrator telling the story. I remember the TV series "The Wonder Years" where you could hear the thoughts of the protagonist. Maybe this could be like what was thinking Mulder and Scully when they investigate? But this doesn't mean that you understand what to do next. * Fixed styles: Discworld (from Psygnosis) solved the dialogs using icons for each kind of conversation: generic, joke, question and insult. But it's like then gas example. The same thing in Sam & Max. I see the "No dialogs" in bold. That wasn't my intention. I mean, that's not necessarily the option I choose. BUT, dialog puzzles also have the potential to be very tedious. I remember in Curse of Monkey Island coming across new characters and sighing, because I knew I was going to have to sit through a very long dialog tree, clicking over and over to make sure I'd exhausted all the paths to get all the potential character and plot info. It was like a huge interactive exposition dump that slowed down the game, when I just wanted to get back to solving the puzzles, exploring the settings, and finding the humor in the "look at" descriptions and combing objects and things like that. I also found that was the case for parts of Grim Fandango too, mainly in the beginning... dialog puzzles can sometimes feel like it really is just a "tree" where you have to go through and exhaust every possibility and it can end up being a bit of a chore. So I'd say if you do them, please make sure it's just a few paths of top notch stuff for each conversation, rather than loads and loads of "just ok" dialog..
Can I second this notion? I think you have hit on exactly where dialog puzzles in some games go wrong. Many adventure games in particular ruin the fun of reaching new locations by also having a bunch of new characters, each with long dialog puzzles. Trying every branch in the every dialog tree becomes work, but you know you have to do it because who knows which branch might contain a piece of information or item you need or whatever. In games like that I lump the dialog puzzles in with cutscenes, in that they are actually taking the player out of playing the game. With that in mind I think that dialog puzzles (like cutscenes) add to a game only if they are concise and to the point. And there needs to be some reason for each ones existance (humor being a good enough reason). The example you posted here Ron is about the perfect length for a dialog puzzle IMHO. Also hopefully if they are short like that we can still enjoy the fun of dialog puzzles without trading off much else in the game. Well ... up until now I was more or less on the fence. Wanted it either like Maniac Mansion or Monkey Island -- I didn't really think in shades of grey about it, or thought that this might be a bad thing. That might have been a mistake. I mean, look at the step up in Indy 3. Zak already had quite a bit more triggered dialog than Maniac Mansion, I think, but Indy 3 really got it going. But I remember how disappointed I was in Indy 3, as you could only talk to a select few of all characters. With many characters, the "Talk to" very just ... did nothing. It behaved like "What is", when you hover the cursor on something cool, only to find out it's just decoration. I was fine with "What is" not registering stuff, it still feels like a big, fully functional world to me regardless, but not being able to talk to this or that person felt like someone was needlessly putting a stop to my sense of curiousness. But if it's not just "toned down" but really done well, that'd be a bit like having the dialogs of Indy 3, but this time there is no invisible barrier there, designed to stop you from running face first against the wall of the matrix, so to say. Characters could all respond in some way, now. That happened in Curse of MI, where each new major location was introduced with a pretty long animated cutscene, followed by even more plot info with dialog puzzles with every character. You can't really compare Maniac Mansion with Thimbleweed Park. While both fit into the category of adventure games, Maniac Mansion is basically a rescue mission, while Thimbleweed Park is a who dunnit. When there are questions to be asked there should be dialog trees. You need to look at each character individually and decide whether or not that character is likely to enter into dialog. Whether or not the game is likely to have existed in 1987 is irrelevant. How do I become a pirate? Who is LeChuck? What is the Secret of Monkey Island? Guybrush needs answers people!! Anyway, how often do you strike up a conversation with a bunch of lunatics, or a talking tentacle? What you are saying makes sense! Indeed he does. I also like to think that people look at dialog not only in the way that we figure out what characters respond to the main cast. Look at each character as if *they* were the main character and then the dialogs will feel a lot more interesting. I feel like you'd need a simple validator/analyzer to make sure that all your conversations have a way to get to exit, that all nodes are reachable, and that you don't hit any infinite loops (basic graph algorithms). With enough nodes, especially if everything is in the same scope, it likely becomes non-trivial to prove that all cases do the right thing. Otherwise you'll drive yourself insane modifying the dialog graph, especially since you're allowed to modify global vars with the '!' operator. This is a neat format but it looks super dangerous to me. Just for entertainment, I coded up a toy that can handle the above dialog puzzles with a few minor modifications: I changed "exit" to "-> exit", I don't handle "!talked_to_sheriff = YES", no stage directions, and I require a 'greeting' block since I don't have a game that can ask for any conversation node. Seems Ron can simplify his dialog work a bit. Great job Mathew. Now I'm dreaming of features to add to this dialog puzzle scripting system. It'd be neat if particular nodes in the trees could select an element from an array of character lines, so that most of the tree would be the same, but at certain nodes, each character could have a specific reaction to a particular turn of phrase. I love the idea of auto parsing these to ensure some basic correctness, and aid with debugging. Also, as this parser is parsing this input file, you could have it generate a language specific file, and actually just insert references to the language file into the resulting code. That way you'd have one English file that someone could translate into other languages, and it should just fall into place. There are of course lots of issues with translations, but this would at least separate out the script markup from the language to be translated. The name is Crook, Sheriff Crook. I do want to echo an earlier post by saying I think a game of this nature- one that involves detective work- absolutely requires the necessity of dialog puzzles/trees... Ask a character the wrong question or say the wrong thing, and you might not get the whole story- requiring you to acquire more clues or solve a puzzle or two to get the info you need. Nice and readable script, but how do you localize the dialogs? Maybe different files. If all the dialog is already finished is just copy paste and edit for the new language. I totally agree on the "pure text" sentiment. I rather manually edit my data as JSON in a text editor than having it in a database and doing the [add] - [OK] -  - [OK] click-a-reno. Hi everybody, about the caracthers Maniac Mansion style colliding with the new backgrounds Mark Ferrari style, have you thought about redoing the characters in DOTT style? Doing the characters in DotT style would mean doing the backgrounds as well. I know this is going to rile up some people, but I never liked the DotT art style. It was too goofy and cartoony for me. It was a product of it's time. Artists (not just at Lucasfilm) were rebelling against the constraints and exploring new art style and doing as wacky as you could was very appealing. Lucasfilm wasn't the only company to do the Chuck Jones style as it seemed as far as possible from what had been done. It's a trend that didn't last as everyone figured out they can do interesting art style and not crazy for the sack of crazy. I think it dates DotT a little. I know a lot of people will disagree with me and that's fine. I agree. I didn't like DoTT style even when it was published. It just felt too... made. Same with Sam & Max Hit The Road, although it wasn't that bad. I actually complained about this in my bachelor's thesis (yes, it was about Lucasfilm Games / LucasArts). I liked how different LucasArts games had those different styles -- they all had great pixel art, but different flavors within the same overall format. I have a question: If you compare the Art Style of Maniac Mansion, Zak Mckracken, Monkey Island 1, LOOM, Monkey Island 2, Last Crusade and Fate of Atlantis -> which Art Style do you like most? What do you think of the Art Style of The Dig ??? Wow that is a big question. The thing when you compare all these styles is, like with much other pieces of Art... you don't want to pick one. You want them all. It is not just Nostalgia, I think the C64 graphics/style of Maniac Mansion is unforgettable. The PC and Amiga/Atari ST screens are higher res and ... they have the look we're getting in Thimbleweed Park, but when I actually play the game, for some reason I return to the C64 version more often than not. If I absolutely HAVE to tell you what styles I prefer, top 10-like ... then here goes. I never liked LOOM, even though I adore the looks of it as much as Monkey Island .. the game somehow ... without the verbs and all ... it just ... made me sit in front of the screen and keep wishing it had verbs. Rinse repeat. I haven't finished it even until today, despite numerous attempts. I try again .. and immediately realise why it ... bores the hell out of me :(. PS: I realise The Dig and Full Throttle didn't have verbs either, but they had a lot more interaction that appealed to me. The melodical magic is a nice idea, but just not for me. It was clunky and just plain not fun. I tried again and again to play Sam and Max. I finished the LucasArts game but ... I have all three seasons of the Telltale games and it .. just .. is ... too ... goofy ... for me. I can't help it. Glad TP is not going to look that way. I must admit that I have always liked both DotT and it's art style. It was a well-balanced exceptional game overall. However it would have worked as well with a more serious art style. Other adventure games (just like Larry 7) imitated this style but didn't convince me at all. My personal favourite in this matter is the Monkey 1 style, followed by Monkey 2. Okay, Monkey 2 was a bit too rough. Moreover the characters weren't enough silhouetted against the backgrounds. Sam & Max were in dott style,right? I bought the game recently, but I haven't played it yet. I took a look at some gameplay video now and I see that the graphics are more or less the same except for the big exception that the lines are straight in Sam & Max. The lines were very curved in Day of the Tentacle. :-( I prefer straight lines! I mean the doors for example. It's harder to see/find things when the lines are so damn curved like in Day of the Tentacle. I hope/guess you know what I mean. As far as art design goes? DotT's art was inspired by Chuck Jones; Sam & Max was very much based on Steve Purcell's comic book work. Sam & Max were in dott, right? Only Max the rabbit appeared in DotT. But in Monkey Island 1 both appeared. I love cameos! Chuck the plant has also been a great idea! By the way: What about inventing a successor for Chuck the plant, since Disney should have the rights for Chuck? Maybe a cactus... or a man eating plant like the one in Maniac Mansion... or an evidence eating plant? Ron, I'm not too fond of the DotT style either because it's goofy as you say and I think it's hard to see/find things because the graphics is so warped. I'm compleatly the opposite. The distinct style is what makes DotT age very well. It's for the same reasons why World of Warcraft has held up as well as it has for the last 10 years - a very distinctive artstyle. This being said as long as the style lends itself to the world portrayed. DotT's style wouldn't have worked very well in the universe of The Dig. Both games are in my book gorgeous to this day. NOOOOOOOOOOOOOOO! Ron, that’s not fine.. please say that crazy art style is alright for its own sake! You’re braking my heart! It's a very interesting picture, but I still prefer the old graphics style. Thank you for the link! Why not just have dialogue trees very sparingly throughout the game only when they would really be appropriate and interesting/amusing? It doesn't have to be all or nothing, just a handful of times that they occur would be fine with me as long as they serve a purpose and fit in with the game. I feel the same way. As our characters are investigators, they should be able to question people. So, there should (despite my latest note) be a 'Talk to' selection, but I think it should invoke only 'I have no questions to him about the case', when there is nothing to ask about the case. When clues suggest a person might have information, then there could be a dialog. Yeah, I feel the same way that if the game does have dialogue trees, it should really be the two detectives who trigger them the most. Dialogue trees shouldn't be completely limited to just the two detectives, the other playable characters should somewhat occasionally have the opportunity for dialogue trees to occur as well, it's just that the two detectives are exactly that - detectives, and it's natural for them to be asking lots of questions. "Just the facts, ma'am". I LOVE Dialog. I play the adventure games mostly for the dialog. Please make the dialog rock! About your problem with your budget, have you ever though on outsourcing? I own a company in México that does software development, we have made some small entertainment apps for the iOS and software for other companies, currently we are working for a USA startup that does money transfer (we are configuring their server to be PCI compliance, developing their backend and mobile apps), they are actually already on production, but improving their software. The benefits of working with a Mexican company is that we are close (almost have the same time zone) and your currency is worth more here than there, thus a good salary in México is really a fraction of a good salary in the USA. If you are interested to talk more about this, please drop me a mail, as i'm serious about it. Forgot to mention, I'm not crawling the blogs and forums spamming and offering our services, I'm actually a fan that found his way to this awesome project of Ron and just though on lending a hand. 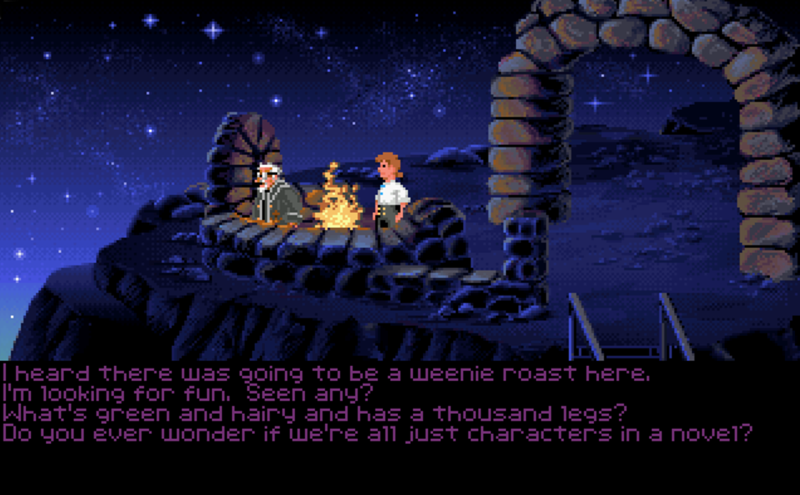 My love for Monkey Island was largely for the conversations - Dialogue puzzles, as you say. Darn hard choice to make around leaving them in or removing. Though the workload sounds immense. I agree with a lot of the remarks above. I especially dislike when the dialogue trees are so large that the programmers do not control them properly and you get inconsistent dialogue. E.g. When your main character uses the name of the NCP before he has heard it, just because you decide not to prune the tree in order. (Had that a few times in Tales of MI). Typically I try to choose the goofy lines first, guessing on the right lines to continue the story afterwards. Another thought: you can drop the generic talk to verb ( in one of the first posts you needed some space for the switch to verb, right?) and instead trigger dialogue (in fixed or tree form) by using items. This can also help to limit the length of each dialogue. E.g use FBI badge on shopkeeper will get you a different dialogue than use chainsaw on said shopkeeper. In the first you will ask the obvious investigation question, in the second you ask for the cash in the register. As I (almost cryptically) wrote early, in the case dialogue puzzle/trees are to be present in the game, to have them as a consequence of some kind of action and *not* due to the (ab)use of the almighty "Talk To" verb. I don't want to replace David, but in my personal experience Zak can buy tickets and whatever for Annie (and in the case Zak run out of money something can be sold for quite some cash, like the bent butter knife, or you can get the help of lotto-o-dictor). Are you sure you are really stuck without money? Can you give some more details? If you bend the butter knife first (like on the loose floorboards in Zak's bedroom) you can sell it as a 'sculpture' for $1500. Even though the airport tickets are non-transferable, Zak can buy an expensive refundable ticket and give it to Annie, who can use the ticket on the terminal and get a full refund. The *bent* butter knife is by far the most useful item for this job, although refunding a ticket is also a valid alternative. In my experience I never found myself in big trouble in having Annie with low cash. It happened just a few times and solved by buying the tickets she needed with Zak. Ron, what if you talk to a NPC and he/she starts to communicate with sign language or speak some other language like Klingon at ThimbleCon for example? Will extensive dialogue trees not also cost a lot of budget with the voice actors? When I saw Thimbleweed Park my dream was: If they use simple backgrounds and not too much animation, then they can maybe easily go nuts on the scope of the puzzles and rooms. That would be fun and such a great world to explore: Imagine an adventure game so big that you have Maniac and Zak and Indy3 inside! And complicated elevators, walking Eds, obscure alternate solutions and bus drivers. I would definitely vote for reduced set of dialog puzzles with limited budget. It's easy to be silent when you are in a haunted house style adventure and basically trying to escape from the scary things. When the game is about detectives, who mainly are about interacting and exploring, it would be weird to not have discussions where the player would be the one who's pulling the strings. And that being said no one is saying that the game has to be filled with these puzzles all around and bore everyone to death, just use them (very) sparingly and when the story calls it to do so. Even the language of cinema uses long bouts of silence to add some extra impact when the expected event occurs. Same goes for movie dialog, it is not necessary to constantly blabber on to make a deep impression. Of course, nowadays it has to be constant explosions and constant jammering or the kids leave the theater. But I don't think those kinds of kids will play Thimbleweed Park anyhow. Less material, less work, but much bang for the buck. But of course, that material has to be really good or that equation won't work. Plus you would eliminate discussion fatique that I too have been encountered sometimes (or actually turn it to discussion anticipation). Also, I could imagine the dialog customization for each character wouldn't have to be that agressive. For example, a discussion with a bus driver or a store clerk could be the same with all characters, easily. I don't of course know the story, the amount of characters in it or the business of writing/managing/funding a voice cast for a video game and many other things but those things came to my mind. Please give us at least one really funny interrogation, maybe even with dialog lines to be selected for both agents so you could go good cop bad cop. Almost everything i think about it has already been written. Do them, BUT short and sparsely. So maybe some dialog could be "voiceless", not without reason though. This could be monologues, dreams, talking with deaf people (combined with refined stanesque handwaving), talking to a fish underwater,... ok no more valid ideas atm, but this list could be much longer. Include dialogue puzzles, pretty please with sugar, nuts, a cherry and chocolate sprinkles! If you do it I'll be your best friend forever and ever. Well, you could easily just place a little "$" Icon next to the TALK-TO Button. This way you could get in-Thimbleweed-Purchases going. "You want to know what whacky answer the sheriff has to offer? For just $9,99 you'll get the "Insanely genuine answer Package" Call 1-800-MORE-CONTENT for more information." Did this format change when you added lip-syncing? How does it interface with the audio recordings?